The University of Georgia Department of Geology will hold its Geology Field School for its 24th year in Cañon City, Colorado. Our Field School is the capstone experience of our undergraduate program in geology and includes the field application of our core geology courses. The Geology Field School is run jointly with the University of South Carolina whereby both schools contribute students and faculty. This arrangement allows us to increase the diversity of our faculty's expertise as well as to keep costs reasonable. Field work is concentrated in the Cañon City area, where the geology is dominated by Laramide uplift and subsequent erosion along the Rocky Mountain Front. This has produced a series of Precambrian-cored structures flanked by folded and faulted Paleozoic and Mesozoic sedimentary rocks. Cañon City lies within an embayment between two of these Laramide uplifts, the Front Range and the Wet Mountains, and these structures are spectacularly displayed within the area. Other features in the Cañon City area include isoclinally folded Precambrian metasediments and Precambrian to Tertiary intrusive and volcanic rocks, and mineralized zones. In the Cañon City area, students measure, describe and correlate classic Paleozoic and Mesozoic sections. These observations are used to construct a geologic column of the region. Completion of this work establishes the basis for geologic mapping of structures involving the same stratigraphic units in the Cañon City area. Projects increase in complexity as the course progresses. The geology is mapped on aerial photographs or topographic base maps with the aid of Brunton compasses and handheld GPS units. In the evenings or during scheduled office time, students prepare final geologic maps and cross sections on digital topographic maps or aerial photographs, facilitated by GIS software. 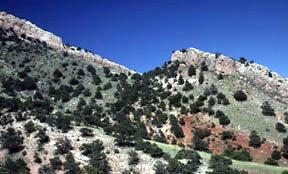 In addition to stops on the way from Athens, Georgia to Cañon City, we conduct two major field trips. 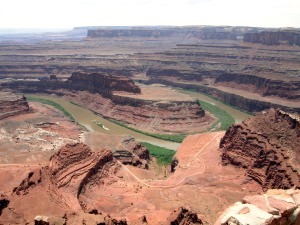 The first trip is to the Arches-Canyonlands and Book Cliffs areas in eastern Utah, during which we study depositional environments, sequence stratigraphy, and sedimentary basin analysis. The second trip is to the Jemez Mountains of New Mexico and San Juan Mountains of Colorado, where we study Tertiary volcanism, ore deposits, and environmental geochemistry. Additional short day trips include mining districts near Cañon City, Great Sand Dunes National Monument, and Capulin National Monument. The field course is taught by three to four Geology faculty and one to two teaching assistants. Typical enrollment is 12-20 students, which provides for an excellent student-to-teacher ratio. While in Cañon City, Colorado, we stay at The Abbey School and each student shares a room with a roommate. Breakfast and dinner are served at the Abbey School. Students pack their own bag lunch for the field. Our tentative dates are May 14 (leaving Athens) - July 2 (returning). With the current upswing in the number of Geology majors at UGA and nationally, we will likely not be able to accept non-UGA students, however a waiting list has been established for summer - contact Dr. Doug Crowe (crowe@gly.uga.edu) for more information. Projected cost for summer will likely be: program fee of $2850 + tuition and fees, which covers room and board, and all transportation, including roundtrip transportation between Athens, GA and Canon City, CO. The prerequisites for Field School are GEOL 3010, 4060, and 4500. However, we recommend GEOL 3020, 4010, and 4020 in addition to the prerequisite classes. Students should register for GEOL 4270 for 6 credit hours during the summer session. Students should check the equipment list to determine what they will need for the program.